We received this award last weekend and I has taken me until now to get on the computer to accept it. Many thanks to Natascha for this. Natascha is so sweet and I am happy to have “met” her. She also makes a lot of very delicious looking food, so stop by her blog if haven’t already and have a look for yourselves. 1. Display the certificate on your website. 2. Announce with a post linking back to whomever presented you with the award. 3. Present the award to 15 bloggers that you think are deserving. 4. Send them a comment letting them know. 5. And the hard part (for me) list 7 interesting things about yourself. Of course you are not obligated to participate and I understand if you cannot. 1. I am a bit of WW1 and WW2 and that time period buff. Anything of that time period sparks my interest. I especially love watching shows set in that time period, Foyle’s War, Land Girls etc. They are also all set in the British countryside which follows along with number 2. 2. I would love to be a Homesteader, to garden and be with my animals all day. 3. My favourite place that I have visited so far has been Portland and Cannon Beach Oregon. Technically it is two places but I love that area. 4. I am from Newfoundland, Canada (though I don’t live there now). If you do not know where that is check it out on google maps. I have several earlier blog posts from there when I was on vacation there a couple summers ago. 6. I just started re-watching (on youtube) “Swiss Family Robinson” the t.v. show from the 60’s. I think it was a Canadian show on CTV. Evie is just discovering it. I loved that show when I was a kid and dreamed of living on a deserted island in a treehouse. It still sounds pretty nice to me actually. Though I wouldn’t like the spiders. 7. I also like watching cartoons/animation. I really like the show “Gravity Falls” and “Scooby Doo-Mystery Incorporated”. It probably has something to do with Evie loving those shows also and we watch them together as a family. Well there you have it! I only took me all night to come up with that, which really should tell you I am not very interesting. Hey, I could have my own show about a Newfie homesteader living in a treehouse! 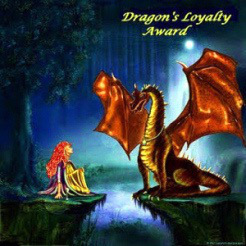 Yay we were nominated for the Dragon’s Loyalty Award! Thank you very very much to my friend over at @Cookswithevie for the nomination. I will be sharing our answers and nominees this coming week. Have a beautiful week to come! Thank you again so much for nominating me for this lovely award. It is always hard to find things about yourself to share with others. I do hope your doggy gets better soon. Congratulations on your well deserved nomination! I really enjoy reading your blog! I sincerely appreciate the nomination. Thank you so much. I hope to have more frugal posts coming your way too!